Director Kaushik Ganguly wiki profile biography life details, Kaushik Ganguly Birthday Address Mobile Phone Contact Number Director Kaushik Ganguly Family Father Mother Wife Children Son Daughter Director Kaushik Ganguly Qualification Educations School College Name Kaushik Ganguly professional Career Awards Achievements Director Kaushik Ganguly Early Personal Secret Professional Educational Life works occupation Kaushik Ganguly latest news updates information. Whether it’s a Tele-Film or Bengali Cinema, Kaushik Ganguly has contributed in each media industry successfully. 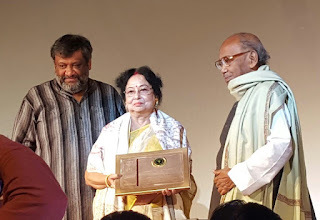 It was ‘Ushnatar Janye’, ‘Aatithi’ Bengali Tele-Serial brought him into limelight and ‘Arekti Premer Golpo’, ‘Laptop’ established him in every Bengali Cinema lovers’ mind. Kolkata born Tollywood Film Director Kaushik Ganguly, graduated from Jadavpur University, is one of the renowned Directors that Tollywood Film Industry have. 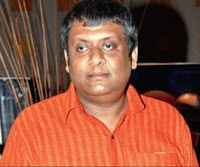 • Birthday of Director Kaushik Ganguly: - 4th August, 1968 (Age of Filmmaker Kaushik Ganguly is 44 as on 2012). • Director Kaushik Ganguly House Address: - Kolkata, West Bengal. 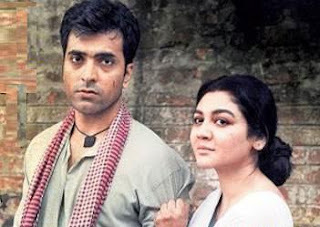 • Director Kaushik Ganguly Family Background: - Father name of Director Kaushik Ganguly is Late Sunil Ganguly [renowned Guitarist], Wife name of Director Kaushik Ganguly is Churni Ganguly [Actress by profession], Son name of Director Kaushik Ganguly is Ujaan Ganguly. • Director Kaushik Ganguly Educational Qualification: - Kaushik Ganguly has spend his school life at Narendra Ramakrishna Mission [Class-V to Class-XII] and then went to Jadavpur University to complete his Bengali Literature degree. • Marital Status of Director Kaushik Ganguly: - Married to actress Churni Ganguly. • Occupation of Kaushik Ganguly: - Film Director, Actor, Screenwriter. Bangla Tele-Films of Kaushik Ganguly: Ulka, Aatithi, Shesh Kritya, Collage, Diagnosis, De-Ray, Ghare O Bairey, Ushnatar Janye, Bandhobi, Bagh Nokh. Bengali Movies of Kaushik Ganguly: Warish, Shunyo E Buke, Ek Mutho Chhobi, Brake Fail, Jackpot, Arekti Premer Golpo, Rang Milanti, Laptop. 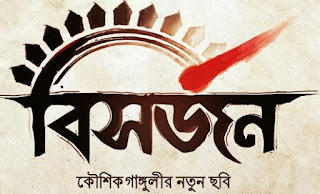 Director Kaushik Ganguly also acted in few Bengali Films and they are - Chalo Let's Go [As Anando], Antaheen [As Mrinmoy], Natobar Not Out, System, Ghuri, Laptop, Nirbashito, Shobdo, Khad, Kangal Malsat. 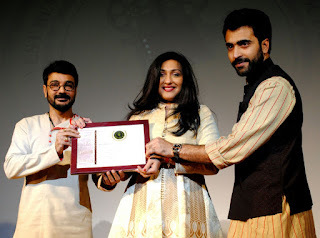 Filmmaker Kaushik Ganguly also directed a Bengali film titled 'Shobdo' based on the life of a folio artist whose life becomes inextricably intertwined with the sounds that he has to produce for a living. Other than, 'Shobdo' Bengali movie of Kaushik Ganguly, he recently directed another Tollywood film titled 'Nirbashito' based on Taslima Nasreen's cat. Good wishes to Director Kaushik Ganguly for upcoming life & Career from the team of Kolkata Bengal Information. We all are looking for more good jobs from you (Director Kaushik Ganguly), so keep on doing your best work for us.